The IEEE Control Systems Society (CSS) has a Technical Committee on Hybrid Systems that is dedicated to providing informational forums, meetings for technical discussion, and information over the web to researchers in the IEEE CSS who are interested in the field of hybrid systems and its applications. The TC on Hybrid Systems organizes and supports conferences and educational events related to hybrid systems theory and applications. The main events dedicated to Hybrid Systems are the Hybrid Systems: Computation and Control Conference (HSCC), which is part of the Cyber-Physical Systems Week, sponsored by IEEE, and the Analysis and Design of Hybrid Systems Conference (ADHS), which is organized by IFAC. The IEEE CSS TC on Hybrid Systems collaborates closely with its corresponding IFAC Technical Committee 1.3 Discrete Event and Hybrid Systems in organizing joint discussions during yearly IEEE and IFAC conferences. The TC on Hybrid Systems supports organization of invited sessions in IEEE affiliated Conferences on topics relevant to theory and applications of hybrid systems. Hybrid behavior is an essential characteristic of real-life systems ranging from biological networks and disease dynamics to power electronics switching circuits and communication networks. The explanation for the omnipresence of hybrid phenomena lies in the fact that the combination of relatively simple discrete and continuous actions/dynamics can produce a very rich behavior. This observation motivated the establishment of a successful research direction within control systems theory, which started roughly more than a decade ago and focuses on modeling, analysis and synthesis problems that involve hybrid systems. Furthermore, the hybrid systems research community has been building up a synergy of computer science and control theory methods that are essential for the design of tomorrow’s cyber-physical systems (CPS). Hybrid automata are currently the most effective tool for modeling CPS, and along with abstraction methods and formal verification and synthesis methods provide powerful tools for the design, verification and control of CPS. The impact of hybrid systems theory on our society can be traced in a multitude of relevant applications, such as collision avoidance in smart vehicles, robotic surgery, nano-level manufacturing, deep-sea exploration, energy efficient buildings, air traffic control, wireless sensor networks and many more. Recent research activities within the hybrid systems community deal with incorporation of hardware limitations (e.g., memory and computational power) and human language specifications (e.g., high-level robotic surveillance tasks) in the design of control systems. These activities have the potential to generate breakthroughs in the development of real-time control systems for high-tech prototypes, such as high-accuracy power amplifiers for magnetic resonance imaging (MRI) scanners, electromagnetic fuel injection systems, robotic surveillance, automatic tuning of synthetic gene networks, and high-precision planar actuators with integrated magnetic bearings. An Introduction to Hybrid Dynamical Systems - A. van der Schaft and H. Schumacher. J. Lygeros, C. Tomlin, and S. Sastry. Hybrid Systems: Modeling, Analysis and Control. J. Hespanha. Hybrid and Switched Systems. B. de Schutter. 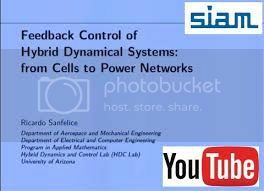 Modeling and Control of Hybrid Systems. E. Abraham. Modeling and Analysis of Hybrid Systems. J. Raisch. Course Notes Discrete Event and Hybrid Systems. W. Zhang. Hybrid Systems: Theory and Applications. If you are interested in joining the Technical Committee on Hybrid Systems, please, contact the TC chair.